Please see the Student Resources page to get a updated (Jan. 10) class schedule for Spring 2019. Thank you. -The class locations for ART264.J1 and BUS284.J1 have been slightly changed. -The day and time for WRT212 has been set. Please see the Student Resources page to get a updated (Dec. 28) class schedule for next semester, Spring 2019 and keep an eye on that page for possible later edits. Thank you. -Elementary Japanese I, Section 1 (JPS101.J1) and Writing Workshop, Section 2 (GEN100.J2) have been canceled due to low attendance numbers. -The teacher for Composition I, Section 3 (GEN110.J3) has been changed. -The class locations for ART264.J1, BUS150.J1, BUS284.J1, and PSY200 have been changed. Please note that posters are only to be posted on the aforementioned bulletin boards and must be in A4 paper format. Moreover, posters not stamped by the Student Affairs department will be taken down and the maximum posting time will be for the semester it was posted. Starting from the first day of the semester, Monday, January 7th, Add/Drop period will start. If you wish to change your registration, please visit the Academic Affairs office on the 3rd floor of the main building to check the availability of courses. Below is the Add/Drop office hours for Spring 2019. If your intended course is still full, you can sign up for “Paper Waiting List” (please note that online registration is only available for the registration days and not available for Add/Drop week). When a seat opens up by the result of other students' add/drop, the first student on the list will be informed by Academic Affairs and asked for the confirmation. You must give Academic Affairs the confirmation by its deadline. The submission of the Add/Drop form is due by 5:00 PM of Jan. 11th, and the late submission is NOT accepted under any circumstances. It is your responsibility to get a signature from your advisor in a timely manner. Please mark down those important dates on your calendar and plan accordingly. 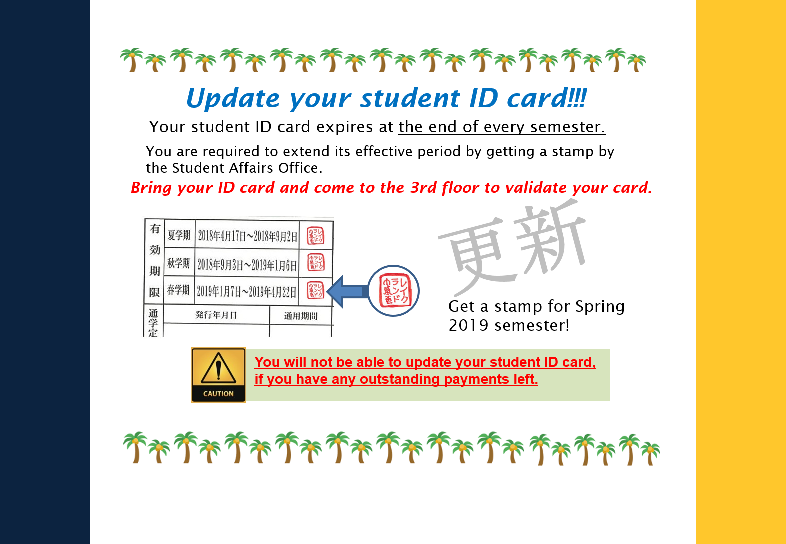 As the new academic year starts, please come to the 3rd floor Student Affairs office of the main building after 1 pm on Jan. 7th to receive your ID card if you are a new student or a new stamp if you are continuing in order to validate your student ID card. If you have any overdue payments, you cannot renew your student ID card, so please make sure to prioritize this. The first ALEKS Placement Assessment of the semester will be scheduled on the following day and time. TIME: 1:30 p.m. ~ 4:00 p.m. This proctored test is for all students. If you are interested in taking this assessment, please reserve a seat before January 7th (Mon.) by sending an email to or visit the Academic Affairs office on the 3rd floor of the main building. Please remember that the seats are limited to 18 people. ALEKS is a web-based math placement assessment for students to test out of various math courses we offer (Mathmatics Workshop, Intermediate Algebra, Pre-Calculus, Probability and Statistics, and even Calculus I). In other words, the score results will be used to determine the most appropriate math courses for you. Please understand that 1) you will not earn credits for those exempt classes, and 2) you cannot register for courses from which you are exempt. However, this is a good opportunity for you to know your strengths and weaknesses and better prepare for the math courses. In order to take this assessment, you need to create your own account for the price of $25, which must be paid via credit card. For more details, please see the instructions and webpage guide available on "Student Resources" page. Please read the instructions carefully and be prepared for the test day! Textbook distribution for SP19 is scheduled on following dates and times. Spring 2019 term Calendar and Spring 2019 term Class Schedule are now all available on "Student Resources" under Current Students tub of LUJ website! Please visit and check the Student Resources page. The Student Affairs Office is currently holding various items (e.g., folders, books, and electric dictionaries), so if there are extant items you may have lost throughout the semester, please stop by when you get a chance. We will be holding these items until the end of this next coming semester (Spring 2019). Spring 2019 Academic Calendar Available!